Advanced and feature-rich glass material combined with volumetrics. Volumetric Glass is an advanced and efficient master material designed for rendering volumetrics and glass. 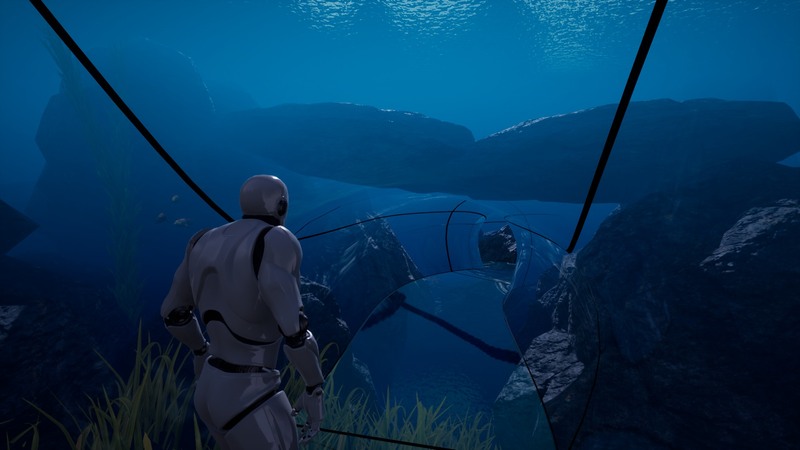 Package is useful for creating sci-fi stylized environment like water tanks, aquariums and underwater tunnels even glass in submarines. Package is perfectly balanced between quality and efficiency. Designed and optimized specially for Mobile, Virtual Reality, and stylized PC/Console games. 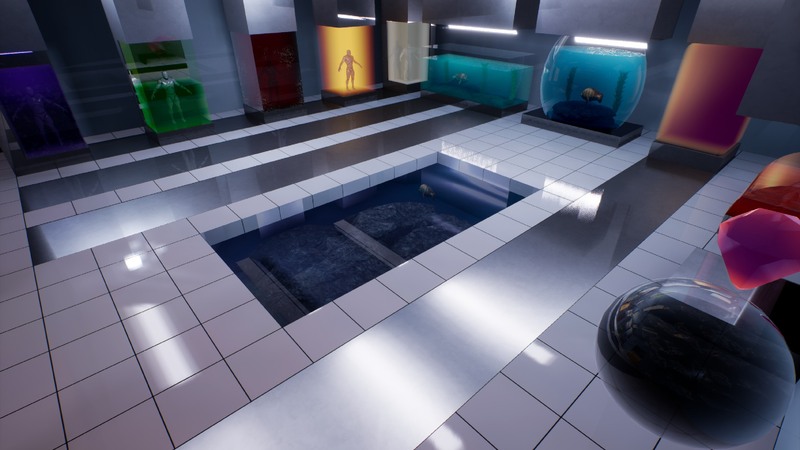 Over 70 parameters to setup: light shafts, volumetric, scattering, glass color, fog density, wet color, reflections ect. Easy for integrate with other water surfaces like Aquatic Surface. Glass Volume (Mterials/M_GlassVolume) – Supports rendering of glasses from the inside of the fluid volume. Represents underwater windows, tunnels, glasses and world rendered from the inside of water. Material is called M_GlassVolume. Glass Shape (Mterials/M_GlassShape) – Supports rendering shapes from the outside of the fluid volume. Useful for water tanks sci-fi stylization, volumetric fog used as environment effect. Both materials should be instanced before using on the meshes. To create material instance from the base material click right button on the chosen material and select “Create Material Instance” option. Glass Shape material can be used on different geometric objects like box, cylinder ellipse. Setup the Reflection Texture cubemap in the material. It should be the texture cached from the scene using the Scene Capture Actor. If you don’t know how to prepare cubemap read Capture Reflections chapter. It is not possible to use Box/Sphere shaped meshes on the characters props or customization elements because it is not geometric compatible. There is additional UseShapedMesh mode in the M_GlassShape material that implements approximated shape for the undefined shapes. Use Fog Exp2 Use exponential fog or linear if false. Fog Base Base depth of the fog effect. Fog Density Density of the fog effect. Fog Color Color of the deep fog. Use Wet Color Enable wet color functionality. Wet Color The color multiplier applied on geometry inside the shape. Use Translucency Whether the translucent effect should be active. Clip plane surface is the effect of clipping the geometry by plane filled by animated fluid surface. Surface Normal Map Texture Texture used as normal-map. UV scale and translation in animation of normal maps on two layers. Surface Normal Scale Surface normal z value multiplier before normalization. Allow to change height ow wave. Surface Normal Flatness Surface normal flatness. Allow to change height ow wave. All of this methods can be used separately or combined at the same time. Only single light source can affects the glass and in can be point light or directional light. Reads the directional lighting values from global settings Materials/UtilsPC_VolumetricGlass PointLightChannel0-2. Point light channels can be controlled by the BP_ScatteringLight blueprint placed on the level witch selected channel to set. Use Channel = false Reads the directional lighting values from local variable Light Direction in the material. Reads the directional lighting values from local variable Light Position in the material. Diffuse Power Diffuse lighting color. Light Color Color of light inside the volume. Whether to use directional or point light. Light Direction If Use Directional Light = true then uses this value as light direction. Length of vector changes fading. Light Location If Use Directional Light = false then this is default location of the light relative to actor. Alpha channel contains Attenuation. Use Light Color Edge Use the light color as edge of the shape. Shape will be lightened in depth. The scale of depth can be changed in alpha channel of Light Color parameter. Use Channel 0/1/2 Select which channel will be used as global point light. Use Lighting Whether the lighting and scattering effect should be active. First you have to place BP_GlassVolume blueprint on the scene. BP_GlassVolume represents the shape of the fog volume that will be used for volumetric glass. Volume is visible only throw the glasses that uses specialized material called M_GlassVolume. 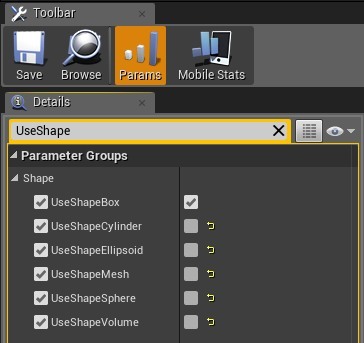 Create material instance from M_GlassVolume and setup the parameters. Fog Scattering Clamp Maximum scattering power. Fog Scattering Scale Scale config of the scattering color effect. Fog Scattering Shift Shift config of the scattering color effect. Fog Scattering Width Width config of the scattering color effect. Glass material supports simplified optimized light shaft effect settings and configuration listed below. LightShaftColor Light shaft color in scattering. LightShaftDistance Distance of light shaft effect from camera. LightShaftIntensity Intensity of light shaft effect. LightShaftPosition Camera position scale when moving light shaft. LightShaftSpeed Light shaft animation speed. LightShaftTexture Texture used as light shaft. 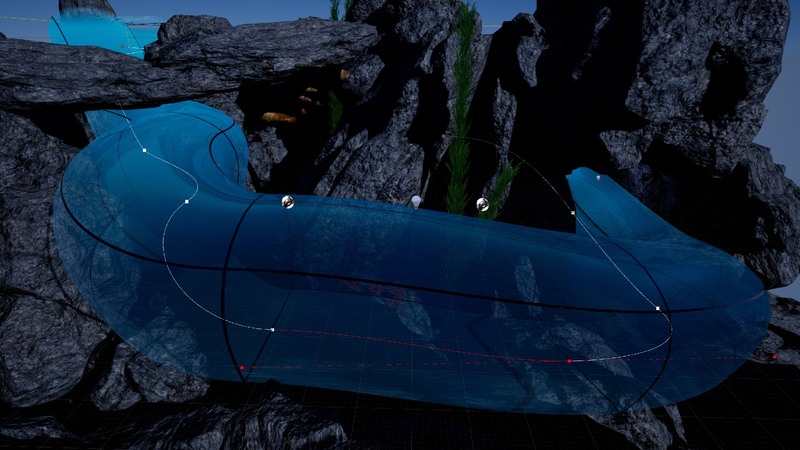 BP_TunelSplineActor is an additional blueprint useful for creating underwater tunnels. To start using this actor just place the BP_TunelSplineActor on the scene and setup parameters. Forward Axis Forward axis of the mesh. Translucency Sort Priority Priority of mesh rendering. Can fix some translucency bugs. Hold Alt+Drag the point of spline to create duplicate of spline point. Volumetric Glass system readers reflections based on the cubemaps cached from scene. It is really efficient method but requires some additional effort to cache the reflection. Place Blueprints/BP_SceneCaptureCube on your map and set up proper position to capture scene (center f the room would be great). Open Material/Textures and find the render target (RT_SceneCapture). Click right on the RT_SceneCapture and select “create static texture” newly created texture is ready to use in the volumetric glass system. Example reflection texture from sci-fi laboratory used on all shapes inside the room. Reflection effect is based on prerendered cubemap. Volumetric glass supports two types of reflection mapping. Spherical reflections and box projection mapping. Spherical mapping – Very fast but inaccurate. Works out of the box. Box projection mapping – Very accurate in box shaped rooms. Requires additional room size informations in the materials. UseBoxProjection Allows using box projection mapping. If disabled then system uses standard spherical cube-map projection. ReflectionBoxExtend half size of the room cached in the reflection map. ReflectionBoxPosition Position camera where the reflection was cached. UseReflectionBoxLocal Forces system to use reflection box capture in local space of actor position. Useful when mesh is connected to the same actor as reflection capture component. 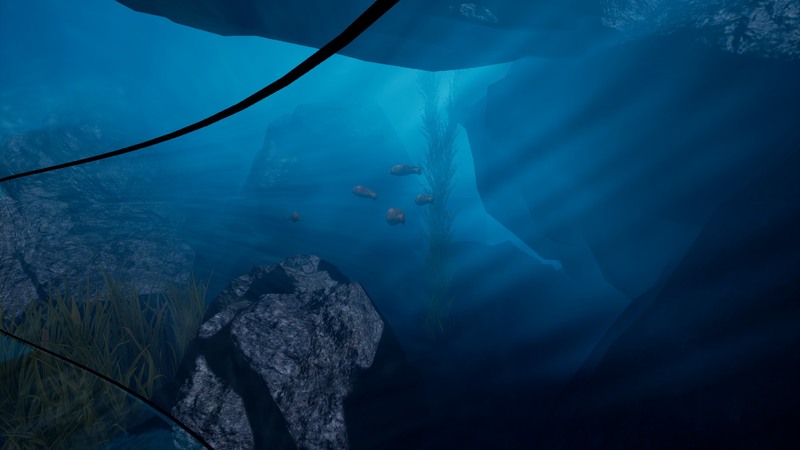 ReflectionColor Color of reflection allow to adjust the cubemap to underwater conditions. Alpha channel represents the power of fresnel. ReflectionTexture Prebaked cubemap reflection texture should be cached in place where the glass is rendered. Use Shlick Reflection Enables physical based Shlicks fresnel calculations. Otherwise uses fast simplified dot(camera, normal) fresnel. UseReflectionBoxLocal When true then ReflectionBoxPosition will be added to the actor position. Volumetric glass materials supports advanced glass surface configuration that allows to customize appearance to specific requirements. Glass surface is rendered before the volume and can cover the objects behind the glass. Glass Color Color of glass mesh (with translucency). UseGlassTexture Allow to use glass texture instead of flat color. UseGlassTextureColor Glass texture color multiplier. UseGlassTexturVertexAlpha Uses vertex color alpha channel as multiplier for glass texture. Broken glass example.